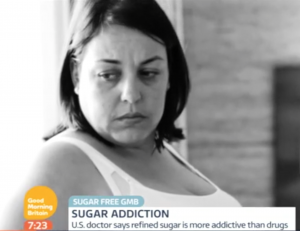 In December of 2014, I had the pleasure of filming a segment for BBC’s Good Morning Britain on the science and treatment of overeating, food, and addiction. There, I was immediately drawn to Carla Andrews, one of the British women featured. I sensed from her a serious determination that she was truly ready to confront her demons and do the arduous work necessary to change her life. At 38 years old, the 254 pounds Carla carried on her 5-foot-2½-inch frame was already burdening her with metabolic disease, including high blood pressure and cholesterol. Since that first meeting, I’ve worked closely with Carla, coaching her as she removed 70 pounds of excess fat, reversed her medical conditions, and discovered her inner adventuresome athlete. She’s also a successful entrepreneur and a single mother of two teenagers, both diagnosed with Asperger’s syndrome. I’ve previously written about her success and consequent enhanced health and well-being. Fourteen months later, I’m circling back to give you a glimpse into the reality of what it takes to maintain newly achieved mental and physical fitness. Dropping inches, fitting into smaller clothes, feeling healthier, enjoying higher energy, and looking fit are terrific rewards you reap as you achieve greater well-being. However, the shedding of excess fat is one process. Keeping it off is another. Sustaining any mind-body improvement requires a lifetime of mindfulness and unending refinements as you continue to be challenged by daily life. The key to sustainable success involves paying attention to changes taking place and then doing the right thing to survive each challenge. The logic behind it is reflected in Charles Darwin’s quote: “It is not the strongest of the species that survives, nor the most intelligent that survives. It is the one that is most adaptable to change.” This mental and physical flexibility is critical and lifesaving, helping us to avoid self-destruction in the face of adversity. I tell the people I coach to A square (A2) it throughout the day—continuously Adapt and Adjust to solve problems and find solutions. With that in mind, here’s a glimpse into Carla’s real-life challenges (you might see some that sound familiar), along with 5 tips for anyone striving to keep the weight off. 2. Understand that life’s a roller-coaster ride of triumphs and frustrations. Buckle up for the ride, and strive to avoid making any kind of strict and inflexible expectations along the way. I created this mantra for people who become paralyzed by disappointments: “The greatest stresses of life come from unmet expectations.” Don’t assume or expect. Instead, hope that things turn out well. Hoping gives you more mental wiggle room in your daily planning, helping to ensure a softer landing when plans are interrupted or take a different direction. Also, instead of feeling down in the dumps when plans go awry, change your perspective and view any challenge as a great opportunity to practice your Adapting and Adjusting skills. For that matter, wake up each day and say to yourself, “Bring it on!” And look forward to every chance to show how well you can navigate each challenge. 3. Act as though your life is priceless. I absolutely loved the way Carla came to understand why she needed to prioritize her self-care. The comparison with what she invests in her car was a real wake-up call. She’s also allowing herself to enjoy personal time away from her other obligations, in order to regroup and refuel. This is a tough one for so many caregivers, especially women, who may feel selfish and often do not feel entitled or deserving of “me” time. If that feeling is a stumbling block to your progress, just remember that the best caregiver is a healthy caregiver! Carla is learning this—and something else as well: Instead of rewarding herself with a food binge, she’s switched out the eating for the joy of moving and then relaxing her body in the delightful environment of her new health club. Yes, it is what the doctor ordered! 4. Know that stress drives cravings. Carla learned early on that she has addictive eating behavior, fueled by her early years of trauma when food was her only solace. We’ve used my book The Hunger Fix as a blueprint for explaining the science of food and addiction, as well as a resource for ways to reverse her typical eating behaviors. The main trigger for the self-soothing eating pattern is toxic stress. When Carla is sleep deprived, can’t de-stress with physical activity, and is confronted with tough child-rearing challenges, it’s easy for her to start to feel helpless, hopeless, and defeated. Slipping down that slippery slope then leads to self-destructive behavior like overeating to anesthetize the pain of stress and the associated mental angst. Looking back, she can objectively describe her behavior. In the moment all she feels is an all-consuming craving. The key is to prevent this from happening in the first place. In reaching out to me, she knows she needs to regroup, and reorganize how she’s living her life to eliminate or minimize the overeating triggers. 5. Remember that no one is superhuman. I’m frequently asked if I’m some kind of “superwoman” who can just whip through life without a stumble, and I have to smile. Look, no one is superhuman. That is a complete myth. We’re all wonderfully human, with our own unique strengths and vulnerabilities. We’re all slugging it out day-by-day, Adapting and Adjusting to the best of our ability. Of course everyone has the occasional “escape and hide under the bedsheets” moment—because we’re human. The difference is where we are in our journeys. Some, like myself, are highly educated in health and wellness and have practiced our healthy lifestyle behavior for many years. We’re just more experienced. We face similar stresses to anyone else’s, but we’re more adept at quickly regrouping and not defaulting to self-destruction. Because we’ve been at it for a while, we make it look easy, knowing that it’s never easy. The secret to success is to quickly identify problems, seek solutions, and avoid self-destructive land mines along the way. That takes plenty of practice, as Carla is now learning. Through her professional work and her inspiring athleticism, Carla is already living her mission to “help guide people to living happier, healthier lives.” Her own struggles gift her with deep compassion for others who may just be starting their journey. On a final note, Carla turns 40 in May. This is a special milestone, as she didn’t want to begin the next part of her life, entering perimenopause, obese and fraught with disabilities and medical disease. She’s achieved that goal. Now she’s learning that mindfully Adapting and Adjusting to each curveball life tosses her way is what it really takes to maintain that which she has attained. That lesson is a priceless birthday gift indeed. Rock on, Carla! This entry was posted in Blog on February 16, 2016 by jason@cybermintz.com.